Happy 2015! Hope you’re all enjoying the start of the new year. 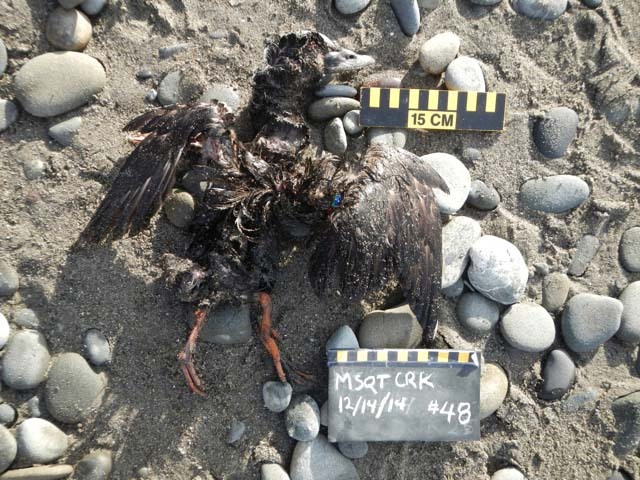 Over the past few weeks, we’ve received many photos and datasheets documenting the wreck of Cassin’s Auklets. Thank you so much for all of your hard work and extra efforts. We know it’s been a busy time, and we really appreciate all that you’ve done to help. 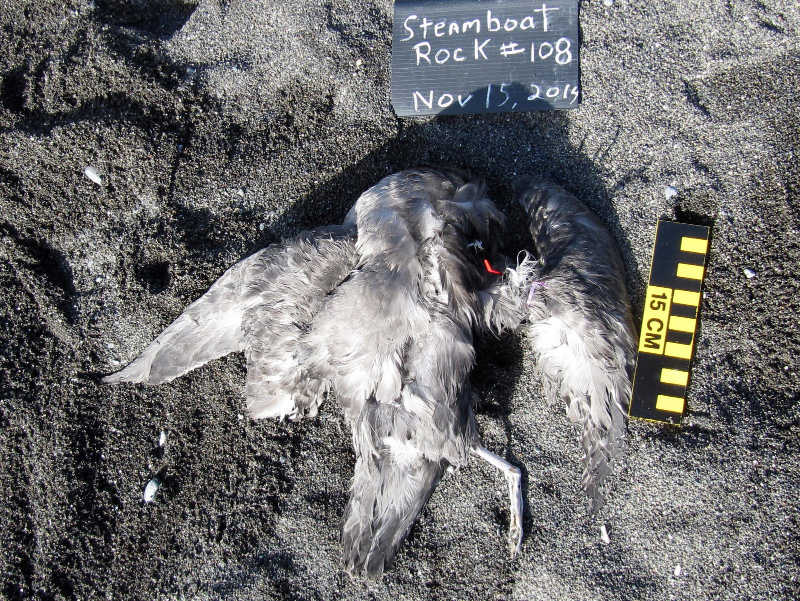 For more information on the Cassin’s Auklet wreck, check out our updated COASST news page. Here you can find links to a summary, updates on the blog, and recent news articles. We’re sad to report that over the past few weeks, we’ve received a few envelopes with a slit in the side and missing media. Your photos are extremely important to us! When sending in your media, if you could possibly wrap it in extra paper or padding to reduce to likelihood of loss, that would be fantastic. Thanks for your understanding. Webbed (go to Q2), completely webbed (go to Q3), 4 toes, 3 webbed, 4th free (go to Q5), tarsus not more than 12mm across (go to Q6), 4th toe shape is loped, w/ flap extending to nail – Waterfowl: Diving Ducks (WF1). Bill does have knob at bill base and extending towards nostril, which means we have a scoter or an eider. 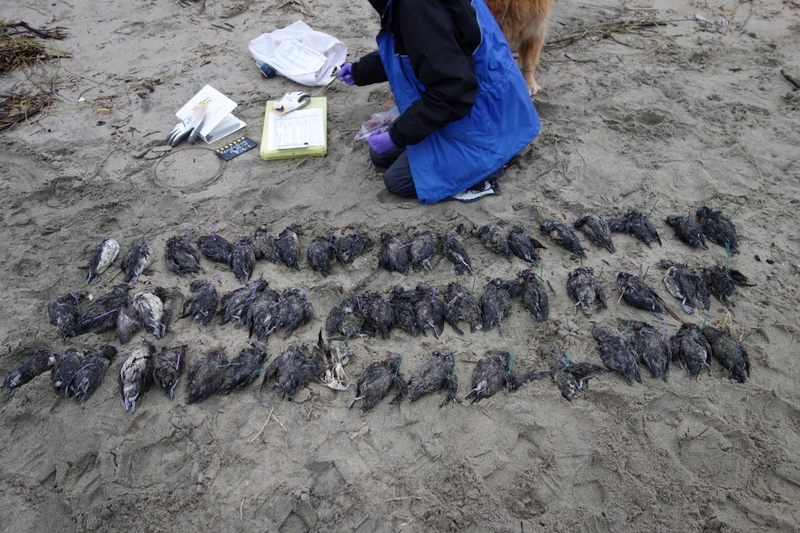 We can eliminate White-winged Scoter (WF5) – no white in wing, and wing chord is too large. Feathers continue along top of bill, so Black Scoter (WF7) is out too. The bill does not match the shape or size of either the King, Common or Spectacled Eider, so this is a Surf Scoter – a female, because the bill is dark. 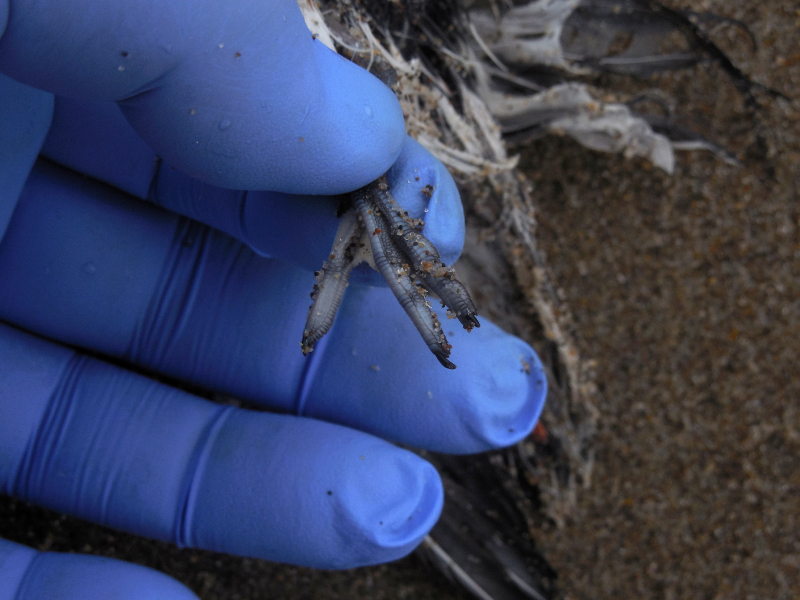 We can eliminate White-winged Scoter (WF3) – no white in wing, and wing chord is too large. Feathers continue along top of bill, so Black Scoter (WF17) is out too. 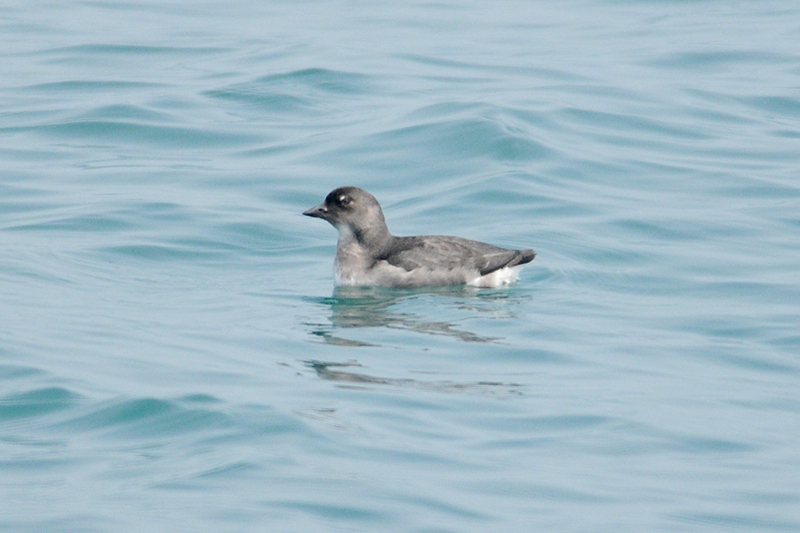 The only other scoter in the guide is a Surf Scoter – this is a female because the bill is dark. Lobed (go to Q14), multiple lobes, small tarsus <30mm: Shorebirds: Phalaropes (SB1). With a single foot, we can’t get any farther. 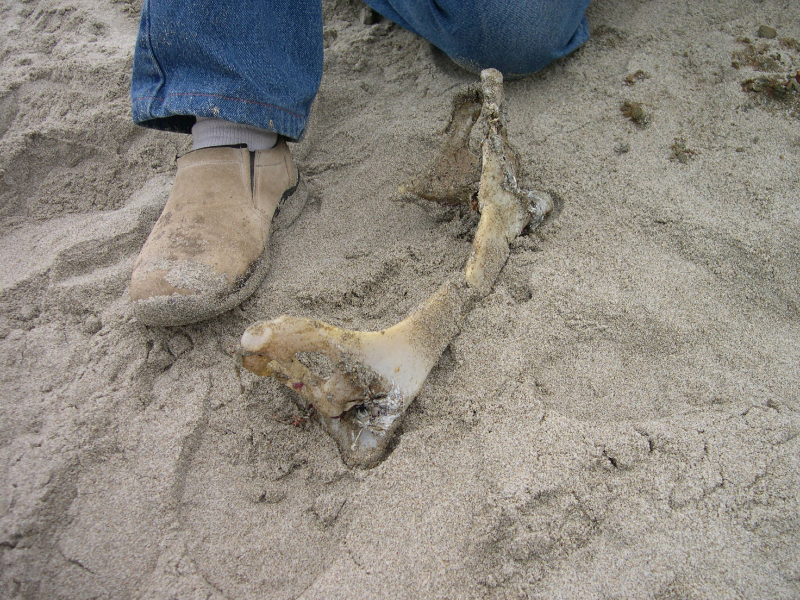 Luckily, Nancy and Steven found more than just a foot! 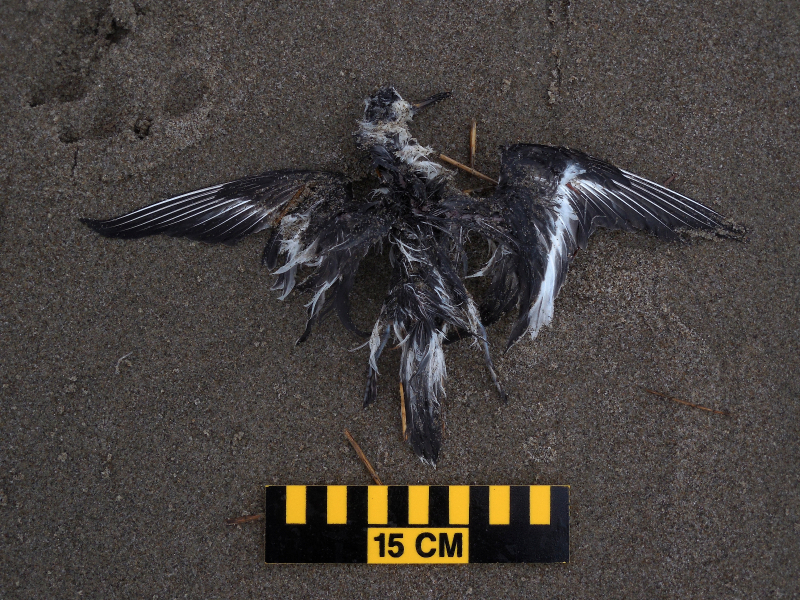 With this additional evidence and the shape of the bill (wide, not needle-like), this is a Red Phalarope, not its cousin, the Red-necked Phalarope. 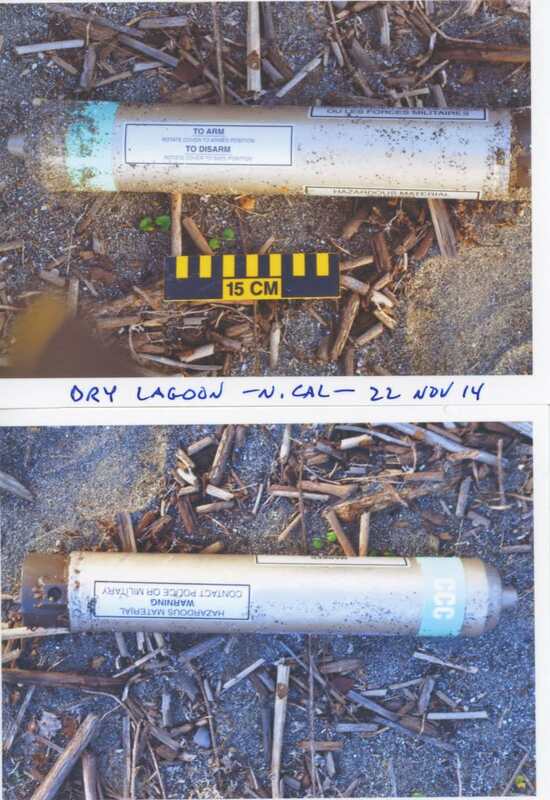 Fireworks, shotgun shells and wads…explosives and their components are not uncommon finds on the beach, but during his Dry Lagoon survey on Nov 22, Rich found an object with the words: “hazardous materials, contact police or military”, seen in the images above. 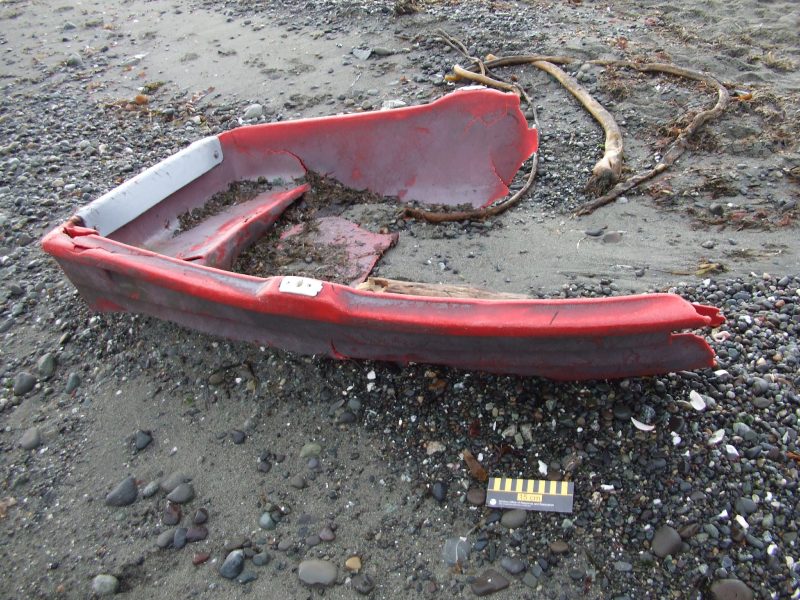 “Marine location markers” like this one do show up on beaches occasionally. Launched from aircraft, they are designed to emit smoke and flames once they hit the water. 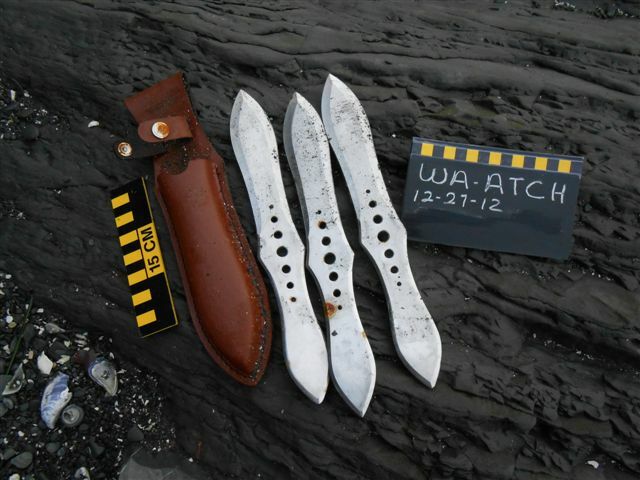 This one was removed by the local Sheriff’s Office, who believe it originated in Canadian waters off British Columbia. 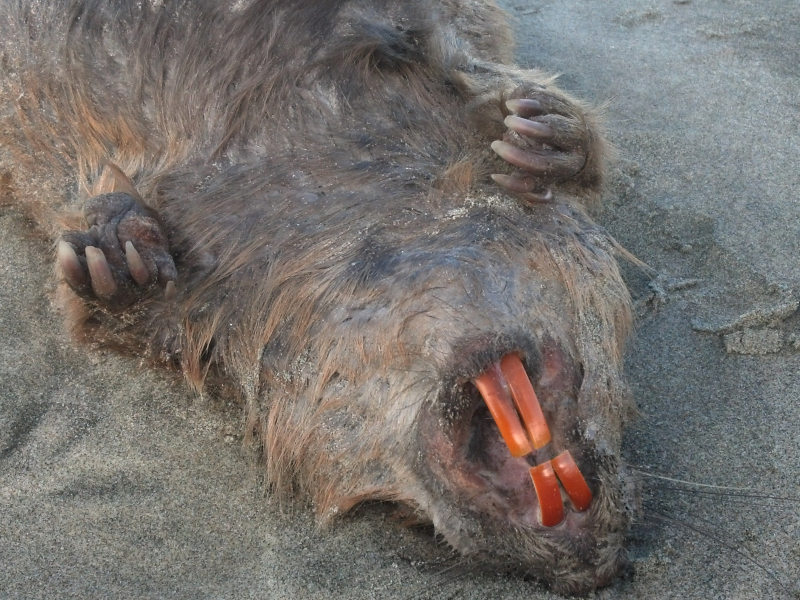 It’s not every day you see bright orange teeth on the beach! Here’s a photo of the beaver that Patty found on her December 26th survey at Oregon Mile 255. How does a beaver cut through wood so efficiently? Since their incisors are harder on the front than on the back, the back of these teeth wear down more quickly, making a sharp cutting edge. 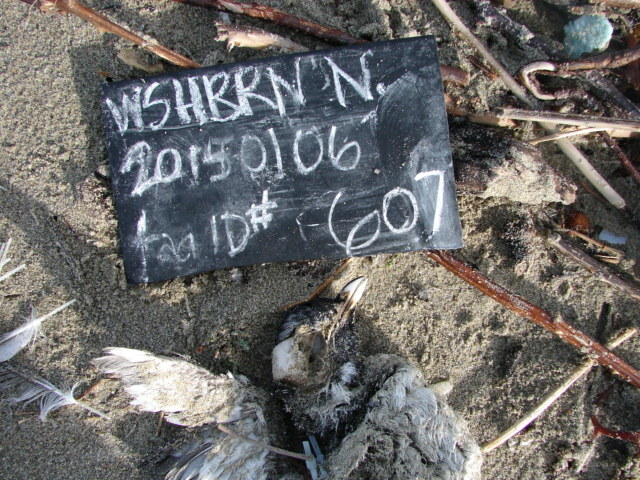 This entry was posted in Uncategorized and tagged Cassin's Auklet wreck update, Happy New Year, Red Phalarope, safety, Surf Scoter on January 14, 2015 by coasst.